Make your holidays extra merry & bright this year with a little crafty fun! 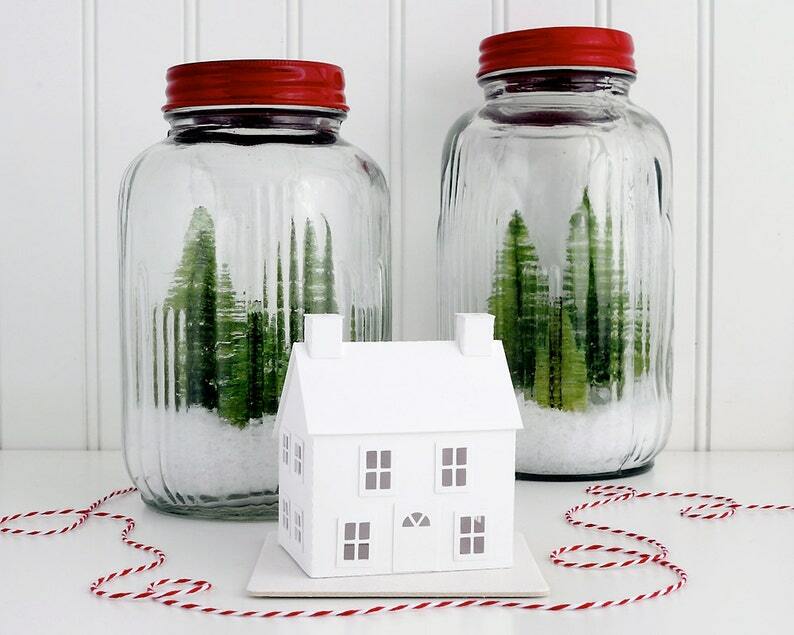 With just a few basic craft supplies & your own creative touch, you can turn this DIY Putz House Kit into a beautiful ornament! Make one for someone special on your gift list...or keep it for yourself! They're fun, easy...and addictively cute! My glitter & snow tutorial has lots of pictures showing how to add the special finishing touches your ornaments! ***This kit is designed for your personal use and enjoyment. The houses & instructions may not be copied or sold without permission. A big hit with my sister, who recently renovated a saltbox. I added lots of personalized items for her. Thanks so much, I really enjoyed making this!! Really cute. A very clever idea and a great gift. • I accept Paypal + all forms of Etsy Checkout. • I love Custom Orders! Once we commit on a design, payment is required before I begin making your custom item. Custom orders typically take 10-14 days in house. I really hope you love your purchase, but if for any reason you are not happy with an item, please contact me so we can work out a return refund or exchange. I want you to be a happy customer! • Processing time (the time before an item ships) varies by item. • Most items typically take 3 - 5 days to ship, but during the peak holiday season it can take longer. • Custom orders typically take 10-14 days processing time. Excess shipping fees over $1.00 will be refunded when I pack & weigh your purchase. •	Under normal, domestic shipping circumstances, US shipping can take 3-10 business days. If your order doesn't arrive in that time frame please don't hesitate to contact me! •	International Orders ship via First Class International Mail. •	Unfortunately, USPS does not track packages outside of the United States so I can't provide a tracking number/delivery confirmation on international orders. •	International orders can take 3 weeks or more to arrive. If your order is taking longer than expected, it may be held up in customs. Contact your local post office to check on it, but please contact me if you are concerned your order has been lost. •	International customers are responsible for paying all import taxes, VAT fees & tariffs of their country...these are not included in my shipping fee. If you have any questions not addressed here, contact me via email and I'll try to help! Sending a gift? Let me know what you'd like to say in the notes to seller & I'll include a gift card with your order! I do my best to portray the true colors of items through my pictures displayed on Etsy. Colors may vary depending on home lighting/ computer monitors.